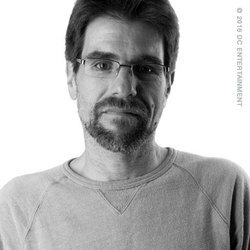 Andy Kubert began his career at DC comics illustrating the highly successful Batman vs. Predator and Adam Strange series. He then went on to Marvel's ultra-popular X-Men title, which was heir top-selling comic during Andy's six-year run. He has also illustrated such titles as Ghost Rider, Captain America, Ka-Zar, Thor, Ultimate X-Men, Wolverine: Origin and the Marvel 1602 miniseries, for which he collaborated with New York Times best-selling author Neil Gaiman (2005 Quill Award for Best Graphic Novel). At DC Comics, Andy has illustrated the best-selling Batman and Son (with Grant Morrison), Flashpoint (with Geoff Johns) and Batman: Whatever Happened To The Caped Crusader (with Neil Gaiman). Currently, Andy is pencilling the third chapter of Frank Miller`s revered Dark Knight series for DC Comics entitled Dark Knight III: The Master Race written by Frank Miller and Brian Azzarello.